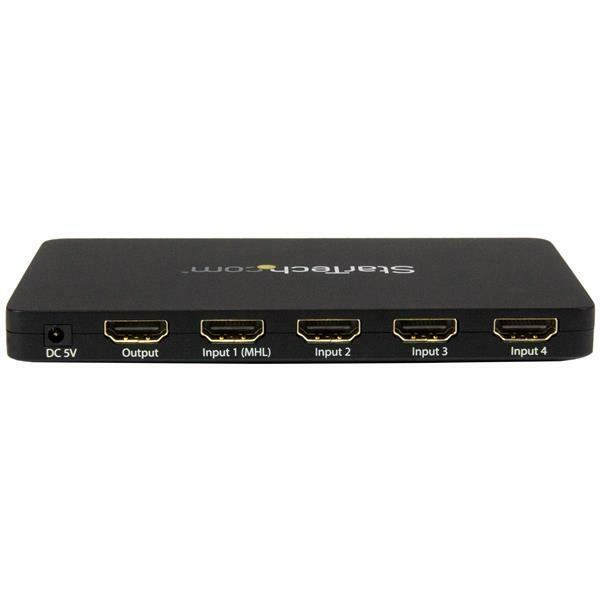 The VS421HD4K 4-port HDMI 4K switch lets you share a display or projector with four HDMI-enabled audio / video source devices. The switch features four independent inputs that each support 4K resolution and 7.1 surround sound audio. The 4-port switch also features MHL support on HDMI input port 1, enabling video output video from MHL-enabled mobile devices such as Samsung Galaxy tablets and smartphones. This switch ensures effortless operation with automatic switching that detects and selects a newly connected device. Automatic switching encourages on-the-fly collaboration among colleagues, by making it easy to share your projector between multiple source devices in a boardroom or classroom environment. The VS421HD4K also supports manual operation using the included IR remote control, or the built-in front panel toggle switch directly on the device. 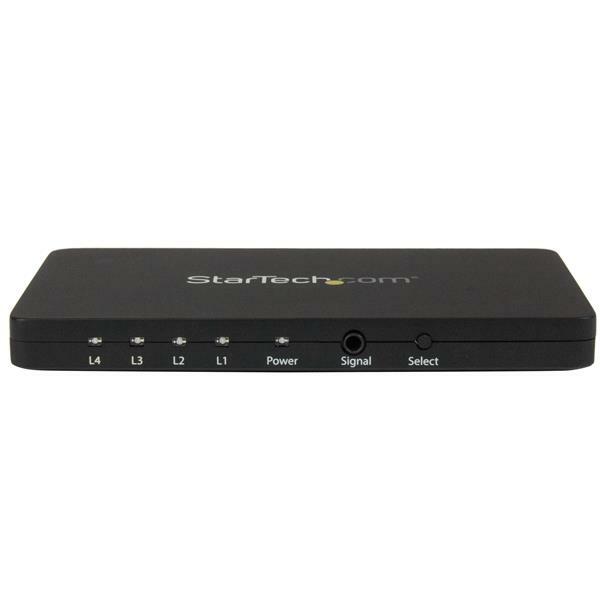 The VS421HD4K is backed by a 2-year StarTech.com warranty and free lifetime technical support. How can I tell if my device is MHL compliant? Mobile High-Definition Link (MHL) allows a standard USB connector to carry digital video signals. To use the MHL output from a mobile device using a micro-USB connector, the MHL output must be converted by using an MHL adapter. MHL can only be adapted to HDMI. Although many mobile devices use the micro-USB connector and the MHL adapters can plug into your mobile device, the mobile device still requires MHL support. MHL support is a hardware specification on your mobile device, and it cannot be resolved by applying updates of any type. To determine if your mobile device supports MHL, research the manufacturer specifications for your mobile device. You can also search for your device on the following website: http://www.mhltech.org/devices.aspx. To make sure that you select the correct adapter, you need to determine if you are using a 5-pin or 11-pin micro-USB. This information can usually be found with the MHL specification on your mobile device. Different types of Samsung devices that use an 11-pin micro-USB require external power to perform the conversion. First-generation Samsung MHL 2.0 requires external power, whereas the second generation does not. A passive 11-pin cable can be used with second-generation Samsung mobile devices. 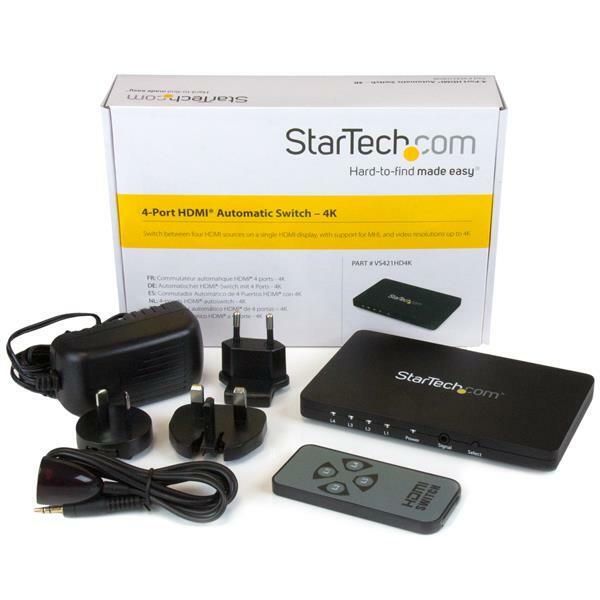 StarTech.com 5-pin and 11-pin adapters have a micro-USB receptacle to provide additional power to the mobile device. You can use a standard micro-USB cable with a USB charger to power the converter. Use the mobile device, display, and video cables in another setup to see if the problem is with the components or the setup. Use a different mobile device, display, and video cables in your setup to see if the problem persists. Ideally, you should test a component that you know works in another setup. Note: You should avoid using adapters to further convert the HDMI signal. If you need to further convert the HDMI signal, make sure that all of the adapters and displays are compatible with the output resolution of the mobile device. Your mobile device is MHL compliant. For more information, navigate to the following FAQ: http://www.startech.com/faq/mhl_compliance. The correct source is selected on your display. The display is compatible with at least 1080p.